... and to find out whether it can be turned into a valid equation by rearranging the matches. If so, you are to output the least number of moves to do so and the resulting equation. An example for a valid input would be 3+6-201=0+0+8. where unused matchsticks are greyed out. Your task is to find out the least number of matchsticks that have to be rearranged in order to make the equation valid. If the input is not valid (i.e. it doesn't satisfy the above EBNF), output whatever you want. Otherwise, if there are ways to turn the equation into a valid one by rearranging the matchsticks, you have to output both the minimum number of rearrangements and the corresponding equation. Just as the input, the outputted equation must also satisfy the given EBNF. In the above example, the correct output would be 1 and 46+6=52. If there are multiple possibilities for the resulting equation, output any of them. Otherwise (so if the input is valid but there is no way to make the equation true), you have to output -1. You are not allowed to remove or to add matches. That means, if the input is built of n matchsticks, the output must also consist of exactly n matchsticks. 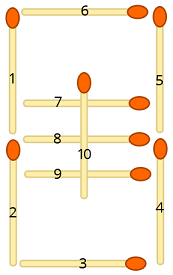 "Empty" matchstick-blocks are only allowed at the end and the beginning of an equation, not in the middle. So, for example, turning 7-1=6 into 7 =6-1 by simply removing -1 from the left side and adding it on the right side with just 3 matchstick rearrangements is not allowed. This is code-golf, so the shortest correct answer (in bytes) wins. The winner will be chosen one week after the first correct answer is posted. Well this is my first time ever submitting an answer, so I don't see myself winning. This is basically a brute force method to figure out all answers and then it grabs and returns the smallest ones in an array. with the first argument being the length and the second being an array with the outputs. Fairly fast as long as the solution is reachable in 1 or 2 moves. When there is no solution you are up for a long wait even in the smallest case of 1=7. This will not find solutions that change the length of the equasion like 11=4 -> 2 11=11, but I am not sure it this would be allowed.